Australian design awards 2017, 2014, 2012, 2010, 2008. To see the diamonds replicated in this exhibition, you would have to travel to museums in America, England, France, Germany, Turkey and Iran – just to name a few locations (natural history museum tower of London, louvre, Smithsonian, green hall Dresden, etc) . Some replicas are in permanent displays & the full collection travels. 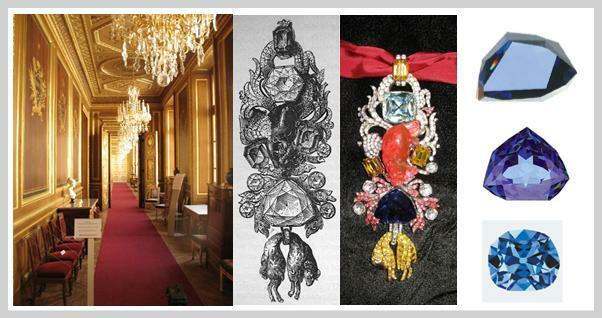 the Golden Fleece was created for Louis XV and was the finest piece of jewelry in Europe during the 18th century. The stones consisted of the 32 carat Bazu diamond, 108 ct Cote de Bretagne spinel carved in the shape of a dragon, the French Blue diamond, three yellow sapphires, five diamonds of around 10 carats each, and over 400 diamonds of about 3-5 points each. This monumental effort culminated in a ceremony 30 June 2010 at the Garde Meuble in central Paris where the Golden Fleece was unveiled to an invitation-only crowd of about 100 people. What made it historically poetic is that the original ornament was stolen from this very building in September 1792.
it was immediately distinguished for its white colour, and exceptional purity. been polished into one diamond. as the Unnamed Brown, the diamond had also been recovered from the Premier Diamond Mine. Over the next three years Gabi and his team based themselves at a secret underground location in Johannesburg, South Africa, where they worked on the masterpieces that would become two of the most famous diamonds in the world. it remains to this day the largest faceted diamond in the world. The Diamond – Just Another Rock? We diamonds have a couple confessions to make. We are not natural beauties and we are not forever. Yes, it’s true. When people see us lying in a stream or in a pile of dirt, they usually think we’re just another rock. We look so ordinary. The first person that picked us up never dreamed we could both serve him and dazzle him. As time passed by, his descendants learned that we could cut any kind of rock or metal, but nothing could cut us except another diamond, so naturally we got drafted as saws, knives and drills. Yes, diamonds were used as tools long before they were cut as jewels. We’re proud of the Taj Majal in India. Its intricate marble designs were cut by diamond tools. We’re equally proud to see how indispensable we are to twentieth-century man. He uses us to drill for oil and gas, to mine ores, to fashion gemstones, to cut metal parts for cars, rockets and farm machinery. Dentists use us to drill teeth. Surgeons use us to cut bone and tissue. When man discovered that we diamonds can drill and cut better than anything else, he only began to recognize our potential. Outer space and defense programs take advantage of our ability to resist radiation, temperature and chemical damage. The electronics industry relies on us because not only can we conduct heat as well as any metal, we are also good electrical insulators. Think of us the next time you use a phone, a computer, a refrigerator, a television or an electric light. Is it any wonder that companies like General Electric and Japan’s Sumitomo electric Industries have spent so much time and money learning to create diamonds? Yes, man-made diamonds are now a reality. Most of you people are probably more familiar with our optical qualities – our transparency, brilliance and sparkle. These have not only earned us a reputation as the most important gemstone, they have also increased our practical value by making us useful for lenses, lasers and windows for outer space. Maybe you think we’re conceited for telling you how good we are. We’re only trying to prove that we’re not just another rock. Actually, we’d be the first to admit that we’re only simple folk. Coal and pencil lead are our next of kin. All of us are nothing but carbon, and that’s why you can’t say that diamonds are forever. When you heart us in oxygen up to about 700oC, we start turning into carbon dioxide or carbon monoxide. We can understand, though, that someone who has a hard time making it past the age of 100 would think that a diamond that’s a few million years old is forever; but to us, a few million years isn’t much. Your scientists are finally beginning to realize that we existed long before your solar system did, now that they’re studying us in meteorites. Man also has a hard time imagining that something so simple and practical as a diamond can be transformed into a handsome work of art. Maybe that’s why it took him so long to bring out our inner beauty. It’s only been in the last few hundred that he’s cut tiny geometrical windows around us to reflect and let in light. Until about 1919, most of us looked a bit lackluster compared to the way we look today. Then the mathematician Marcel Tolkowsky published a complex formula for cutting us that made us more brilliant. 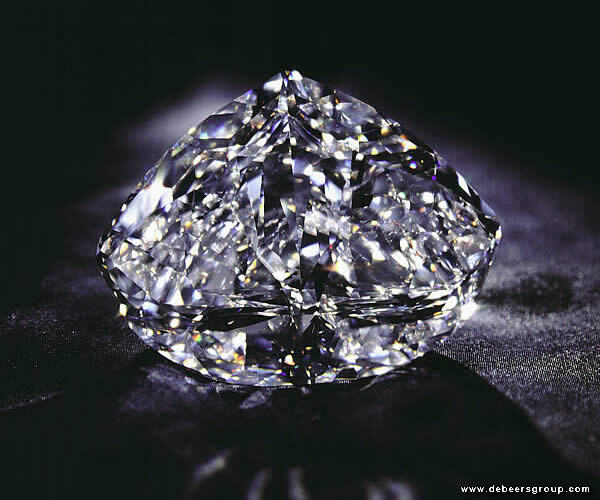 The Tolkowsky formula and other similar ones can only work well on diamonds that pass the jewel qualifying exam – an inspection so severe that about 60% of all diamonds fail. This exam is a nightmare for us. The results determine whether we will bask under someone’s appreciative eye or slave away as, perhaps, a drill. After we’ve qualified as potential jewels, we undergo a beauty makeover that transforms us from ordinary looking rocks into extraordinary looking jewels. Makeover artists, also called diamond cutters, are in charge of this process. When they are finished, we start entering beauty contests. To get top scores in these contests, diamonds must have lively and sparkling personality, an attractive shape, a clean character and individual charm. The judging is subjective and often there are hot debates over the scoring, particularly when large sums of prize money are at stake. We are angered and hurt when people are duped into losing their life savings on us, when workers in the diamond industry are exploited, when arguments, robberies, murders and wars occur because of us. Somebody even told us that we were part of the cause of the French revolution. It had something to do with a diamond necklace scandal. But, on second thought, maybe our role in that scandal was more positive than negative. When terrible things happen because of us, blame yourselves for misusing diamonds, don’t blame us. Fortunately life is not all bad; we do a lot of good. We create jobs for hundreds of thousands of people. We give people a means of escaping from oppressive governments. Non-jewel diamonds help supply you with food, energy, transportation, medical equipment and comfortable homes. All of this good gives us great satisfaction, but there is something that gives us even more pleasure. It’s when our mere presence makes man happy. What a joy it is to see the delight in the eye of newlyweds admiring their diamond wedding rings. What a joy it is to see a widow’s grief interrupted by memories of some of the happiest moments of her life, as she looks down at here diamond engagement ring. What a joy it is to see people momentarily forget their everyday worries and frustrations and focus on thoughts of beauty and love, as they glance at us on their hands or wrists. As long as you enjoy us and use us toward good ends, we diamonds don’t expect anything in return for brightening up your lives. Well, maybe that’s a bit of a lie. We will be bold enough to ask one little favor of you. It’s this: If anyone ever tries to tell you that the diamond is just another rock, please tell him he’s full of poppycock.